These days I keep craving food from Singapore, and since there are really not many good Singaporean restaurants (besides Nyonya, which does a lot of dishes Penang style) in NYC, I have been cooking my favorites at home. I’ve been pretty satisfied with my Chicken Rice, Prawn Mee, Fish Head Curry… The other day I thought about a restaurant that I hadn’t thought about in YEARS. I couldn’t remember the name at first… “Soup Kitchen”… “Soup… something…”. Soup Restaurant! My mum was introduced to this place by my friend’s mother and we loved it. The dish that this restaurant is known for is the Samui Chicken. 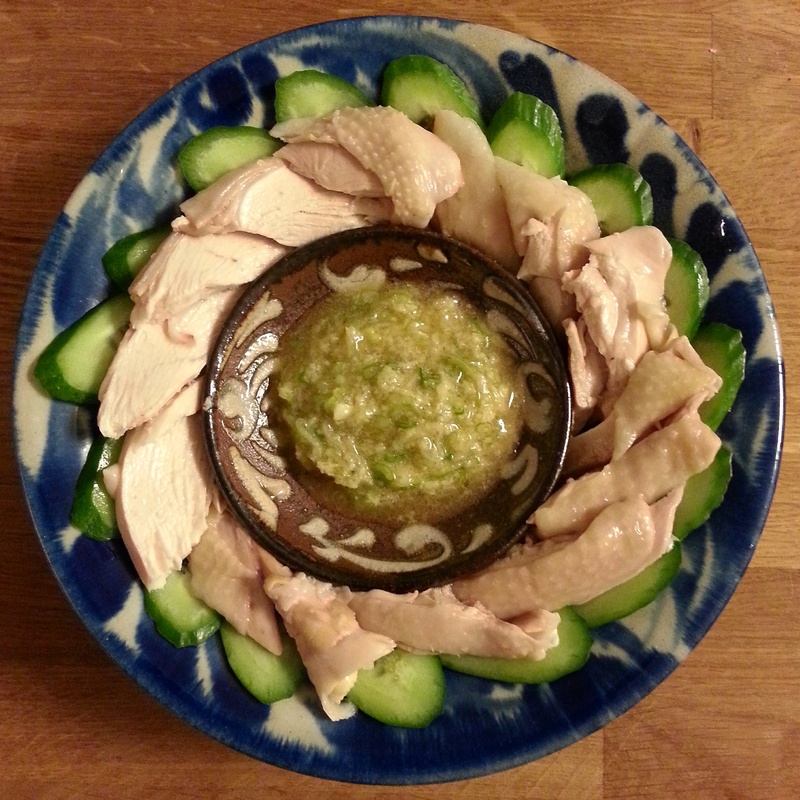 It’s basically poached and sliced chicken with a delicious ginger sauce. Sounds a bit like chicken rice, but it’s eaten wrapped in lettuce instead of with rice. I googled the restaurant and it seems like they’ve expanded a lot and even have a branch at one of the terminals at Changi Airport. Samsui chicken is not a really well known dish- it was cooked by the Samui women of Chinatown just once a year during Chinese New Year, because they were too poor to regularly consume chicken. I tried searching for recipes but all I found were a handful of recipes on blogs. So I read a few of them and cooked according to my memory (as I usually do if I use recipes). I got a beautiful chicken from Dickson’s Farmstand Meats at Chelsea Market. I rubbed it with salt (outside and inside the cavity) and put it in a cast iron pot, breast side up. I filled the pot up with water until the chicken was just covered, and added a bunch of scallion, a few small pieces of smashed ginger and about 8 cloves of smashed garlic. I heated up the water and when it came to a boil, I turned off the gas and put the lid on it and left it for 40 minutes. 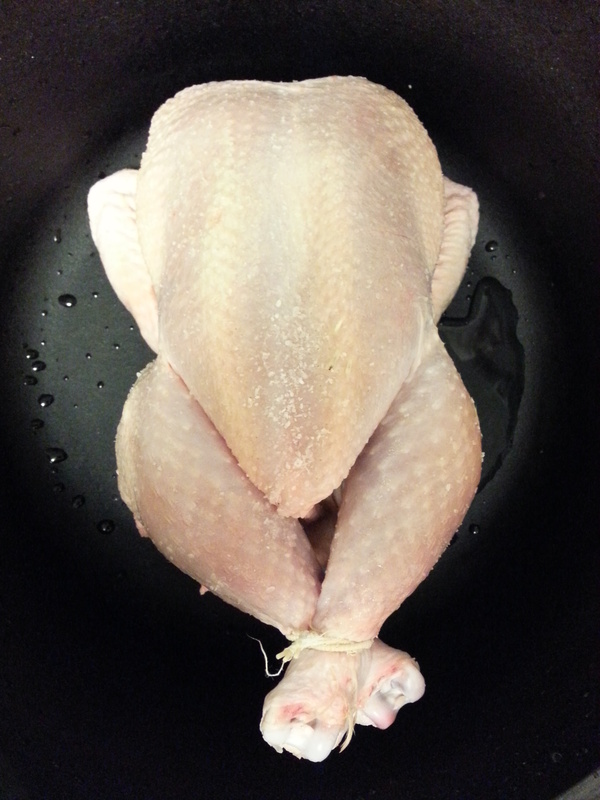 Just before I put the lid on it I turned the chicken around- breast side down. The chicken should be cooked through after 40 minutes. Remove it from the pot and cool it in an ice bath. This will tighten the skin and flesh without letting it lose its juices. Meanwhile, make the sauce. I couldn’t find young ginger so I used regular ginger. I’m fairly certain that this would taste MUCH better with young ginger. I used a stone mortar and pestle to crush the ginger first, but it didn’t look too good. So grate some ginger (until you have about half a cup) using a Japanese grater. Heat some oil (about a quarter cup or so of groundnut oil. I didn’t have groundnut oil so I used rice bran oil) in a saute pan and add half a cup of chopped scallion. Let it sizzle a bit and pour it over the grated ginger. Season with a splash of Shaoxing (Chinese cooking wine), a little pinch of sugar, salt, toasted sesame oil and a tablespoon of the chicken stock (poaching liquid). Mix it all together to form a paste and add more salt if necessary. Cut up the chicken into bite size portions. Serve with sliced cucumber and some lettuce (and the sauce of course). 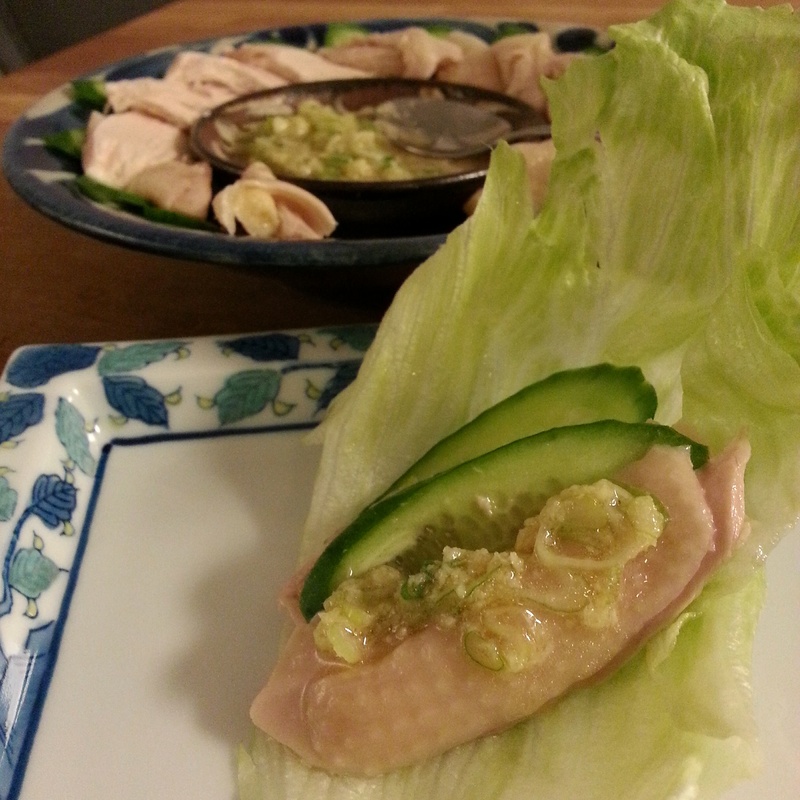 Wrap the chicken in the lettuce with some cucumber and ginger sauce, and enjoy! This is a perfect dish for a family style dinner.